odds and ends and Go Gabba Gabba! 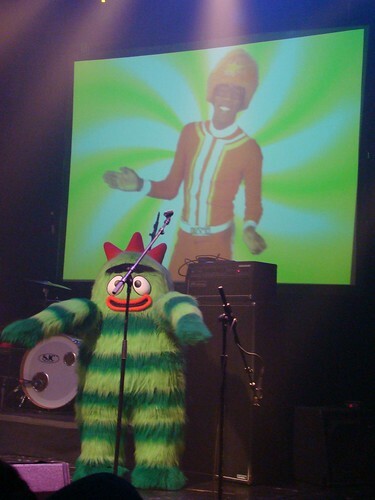 A few bits of news -- as those of you who read Evan's blog already know, we are working on season 2 of Yo Gabba Gabba! Yay!!! Not sure what our contributions will amount to yet, but we are at least doing some writing. So that is fun. Speaking of which, the Aquabats/DJ Lance show back in February was awesome, and Emily had a fantastic time! See loads of photos (not mine) right here. We finally had an actual snow day (at last! a real pile of snow! ), it was lots of fun. I think it was the first snow man ever for all three of us, Emily being just 3, I having grown up in Florida, and Evan...well, I don't know what his excuse is! Here are our snow creatures - a snow man, snow puppy, and two snow bunnies. The snow puppy and small snow bunny are Emily's (with help). The day after we made those, we headed into Manhattan for a meeting (rescheduled because of the snow), amazingly got free parking on Park Ave and on the way back to the car stumbled into fun! Evan said to me, "Hey, look, Scandinavia House" and I said "they have a kid's playroom! It's supposed to be cool!" We went and it turned out we were they on the one day they allow non-members into the kid's playrooms. $5 per kid, parents free. And totally worth it! Emily was in heaven going crazy for the Pippi and Moomin stuff, as well as the Icelandic fairytale landscape in the main room. (The kid's center got written up just a few weeks later in the New Yorker.) Emily wanted to eat at the cafe so we'll probably be heading back soon! This year's Easter, coming in the middle of a load of chores and work and illness, was not so awesome. Plus, I was freaking out the night before because there was not one single piece of candy in Emily's basket (which is really a bucket). Not one. I meant to get her a Lindt bunny like we'd gotten the last two years, but they vanished from shelves before we bothered to buy one. Luckily, she really didn't care. She got bunny socks, a load of books and three new wooden animals for her "zoo". And a Hello Kitty egg dying kit (the vile, unnatural totally screaming bright dye kind!) and it suddenly was the best Easter ever. Then, she put little Hello Kitty stickers all over them. 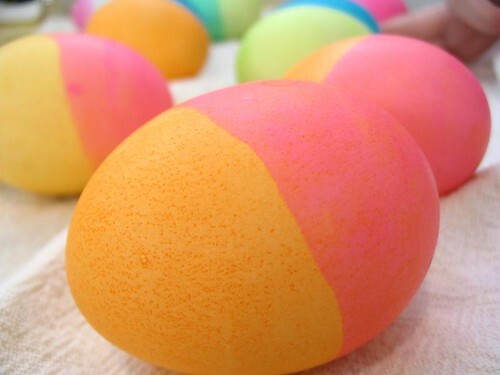 Of course, once they were all dyed and stickered, she wanted to put them all outside for the Easter Bunny (yeah, she's totally got that whole thing backwards) and it took us a couple of days to convince her it was okay for us to eat them. Now she's into it and I'm afraid she'll never eat plain eggs again! There is another swap site I haven't tried called bookmooch -- it's certainly cuter, but the main difference for me is that on bookins you pay to get books but shipping them is free; on bookmooch you pay to ship the books and get them for free. Since we're only sending books out bookins works better for us. But if you have tried it and liked it I'd love to hear about it! As I have mentioned before, Emily loves Animal Crossing. 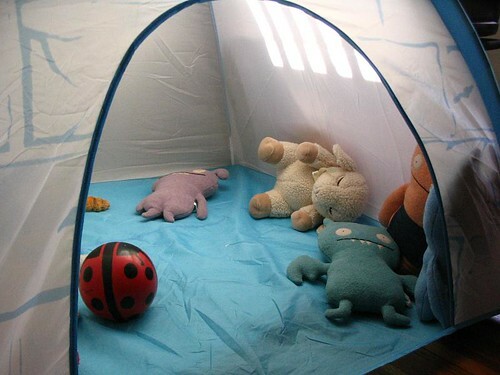 During the winter, animals in the village built igloos every day and she became obsessed with igloos -- having one, going into one, making one...on a trip to ikea we spotted this KOJA igloo tent ($10!) and somehow snuck it right past her. I set it up while Evan distracted her upstairs and it has made the perfect little playspace for her -- she likes to go in there with books, and you can see the current crew who are asleep inside. I wish they'd had this when she was smaller, I'd have let her sleep in there! See all that fabric to the left? Standing up all nice and tidy like a row of books? Never to fall into a sloppy pile or tangle into each other again? That is result of my stumbling across this blog post last week, which explains how to use comic book backing boards to organize your fabric, and going "I must do that now!!" So on our next trip to the local shop, we picked up boards (Golden Age size, if you're interested, so that I can actually store and move the wrapped bundles in magazine size longboxes, and not the ridicuously expensive ones, either), I dug out an extra box of pins and then I got to work. And I am here to tell you that this is a fabulous system. 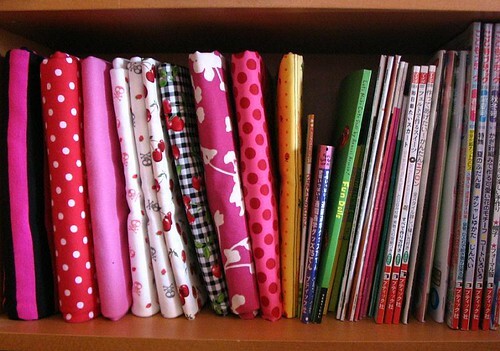 You can shelve your fabric or bin it and easily see everything at once. And it can't leap out of a cabinet and attempt to kill you, either! One note: I lost the blog entry and had to go googling around for it, and came up with several posts about different ways to do this; I think it's important to use this particular method which folds fabric over the top and bottom of the board. This will prevent the fabric from slipping off if it's a bit loose or the pin comes out. 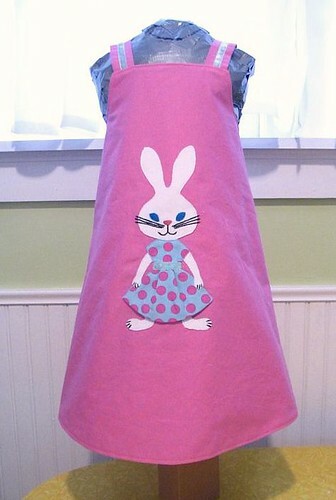 After the muno dress, I was ready to do more experimenting with appliques, and this was my next project: the bunny dress! The dress itself is the "Anna" pattern from Farbenmix, it's a wrap dress that's basically two aprons attached at the shoulders -- sounds weird, but works well and will grow with her really well. And a great canvas for doing things like this! The front section is more of the pink fabric left over from the muno dress; the back is a cotton dot I got from someone I know, Emily specifically asked me to use it in her next dress. The bunny is based on an applique design from a vintage pattern I have -- I redrew it a bit and had to totally redo the dress pattern because the original didn't fit on the bunny's body!! (I felt sorry for all the 50s mom's who tried to make that pattern work and had to go throw back a martini after a couple hours struggling with it.) I was pretty happy with this, it was my first "mixed media" attempt in sewing -- the bunny is a cotton knit, the faces (there's a little bunny face on the back as well) are all embroidered, then the dress was sewn as a flat piece and applied on top. Embroidering the faces was interesting -- I hadn't embroidered anything in years (and I mean years) so I was totally winging it. I didn't honestly even know what stitch I was using, I just sort of did it intuitively. (It turned out to be a split stitch, which later experiments prove to be my favorite for linework.) And I used some sort of sloppy satin stitch on the eyes, which turned out okay but sent me to the computer to request a couple of embroidery books from the library (I do have some needlework books, but they're packed up...somewhere...). But I think they came out fine, regardless of my less-than-precise approach. Here's a detail of the front bunny, and here's the little bunny face on the back. I really love the pattern, in fact I've already used it again for Emily's Girl's Day dress! I'll be taking a break from it for a bit, but I'll definitely be making more Annas. And I will definitely be doing more embroidery!! I'd forgotten how much fun it can be! Emily has been really into hairbows for the past 6 months or so. I had trouble finding what she wanted though (bows with certain things on them, or to go with certain outfits) so I decided to learn how to make them myself. 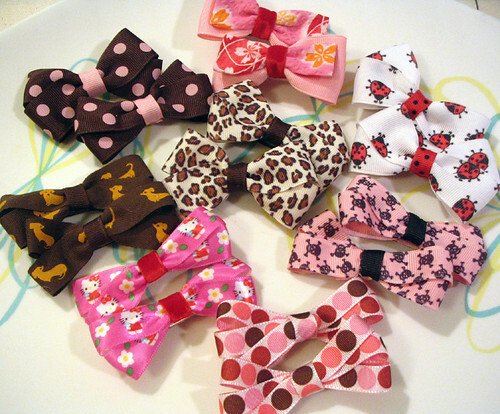 It ended up being easy enough that I made EIGHT pairs of bows to give her on Girl's Day this past monday. (She also got a doll she'd been pining for since December, and a new dress. More about that soon!) I also made an extra Hello Kitty set at her direction for her to give her friend Josie on Girl's Day.